As I may have mentioned, Kristen and I just got engaged to be married. However, at the time of engagement, I decided that instead of buying a ring and presenting it to her, we would go together to pick out and purchase one (well, we'd pick it out together... the purchasing was still one-sided. And no, this was not purely a laziness issue... I thought it would be more romantic to do it together). In it's place I presented her with my ring that I wear every day - she'd bought it for my birthday several years ago, and I love it. Well, in the meantime, we searched around for a real diamond. After a few stops, we quickly decided on this jeweler in Cape Town, Hein. He was really helpful, not pressuring, and really informative, and he right away found us a gorgeous stone in our price range. He doesn't sell pre-made diamond rings - he buys the stones for you and then designs a setting for it. 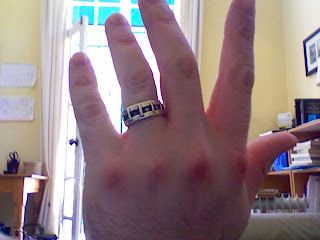 Anyway, the required time finally came and the ring was made, and it's beautiful - we love it. Very modern but timeless - it suits Kristen perfectly. It's hard to do justice to how sparkly it actually is by photograph, but here is our best effort. So, in addition to proposing amongst the elephants, the main thrust of our adventure out to the Transkei was to visit our friends, Alex and Andy of Live Free or Braai Hard in Mount Frere, who are volunteering for Hlomelikusasa (a community-based organization focused on helping orphans around Mount Frere) and ASAP (African Solutions for African Problems - a meta-organization which helps teach community programs to become self-sufficient). They've been there for nearly a year now, and let me first just say how impressed I am with what they are doing, and the strength it must take to do it. I think these guys are amazing for taking the year to do this. Much kudos. First of all, we had multiple warnings about driving after dark in the Transkei. For those who don't know, the Transkei was a "homeland" under the Apartheid government - a.k.a. the crappiest land they could find, where they forced as many black Africans to live as possible. Consequently, it is extremely poor and has shitloads of problems (which include massive AIDS, crime, corruption, and horrendous education). So we were kind of expecting bandits on the roads to come out after dark. What we found out is that this is NOT the main reason for the warning. Mostly you want to avoid driving in the dark because the highway is COVERED with livestock, and you REALLY don't want to run into a cow at 120 km/hr. Mystery solved. We made it out to them after driving 1500 km (~ 1000 miles) along the southern coast, and arrived in the afternoon on Friday. Our friends showed us around the town a bit before it got dark (i.e., we took a walk around the block - it's not a large town). We stayed the night in their surprisingly nice apartment, and the next morning, Andy, Alex, and their co-worker Boniswa took us on a visit to meet a village health worker (Mrs Zindani) and the orphans that she feeds. That was totally amazing. The kids were adorable, the teenagers were really cool and friendly, and the adults were incredibly friendly and welcoming. A representative of the village headman came and welcomed us with a really sweet speech and singing and dancing. It kind of sounds cheesy when I say it, but it really did feel like a big honor, and I felt suitably humble. It is possible that they thought we were there to donate money to Hlomelikusasa, even though our friends told them we weren't. We couldn't get a better picture of him dancing, but he had moves! We made some art with the kids, got fed a huge, delicious lunch, and chilled with the teenagers. It was really amazing. It also really made me want to learn Xhosa, cause it's really a cool language. But damn, those clicks are hard! We drove out to Addo, which is primarily an elephant reserve, and you can drive yourself around to watch the animals. The best part about the whole thing is that they charge foreigners R260 to enter, but they said we counted as locals since we've lived in SA for so long - so we only had to pay R50! Awesome! Also, it had been pouring rain all day until five minutes before we arrived, and then started back up again just as we were leaving - someone knew I had special needs. We proceeded into the park, saw shitloads of elephants (man, they're so freaking cool), and eventually came to a place where you could get out of your car. Is this a sign of danger to come?